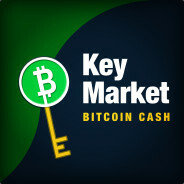 KeyMarket buys and sells CS:GO case keys with Bitcoin Cash. Trade CS:GO Keys for Bitcoin Cash! 1. Add the bot as a friend. 2. Send the bot a trade offer requesting the keys you want to buy. 3. If you don't have enough BCH in your account the bot will ask you to deposit first. 4. Otherwise your offer will be accepted right away. 2. Send the bot a trade offer with the keys you want to sell. 3. If you want to receive your money immediately, provide a BCH address in the trade's message. 4. Otherwise it will be credited to your account and you will be able to withdraw it later by using the withdraw command. *Note: we do not buy/sell vanilla & eSports CS:GO keys, sorry. *Note: when selling keys you must have mobile authentication enabled for at least a week. +Rep Bought keys. Nice and smooth. +Rep. Bought keys. Worked perfectly without issues.